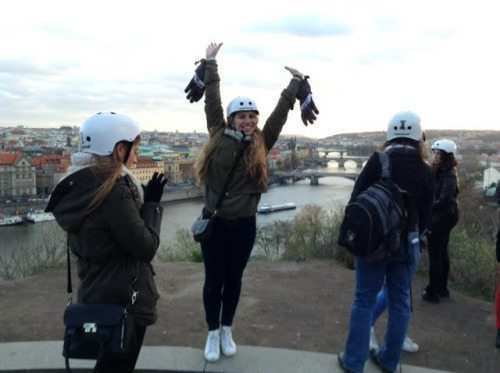 Greetings from Prague! Today was a wonderful day despite it starting out before the sun was even up. We all met at the airport at 5:15 am and after making our way to duty free, we had breakfast together at Aroma where the cashier couldn’t get over the fact that our order was the biggest they had ever had. At first he thought we were one big family. I decided not to be offended that he thought I looked old enough to have 10 kids in their teens and twenties. As we boarded the plane, we were in for a fun surprise as one of the flight attendants was none other than a former Aardvark madricha! In typical Israeli style, we used this connection to get Dylan a seat with more leg room! The rest of our afternoon was then spent on wheels! 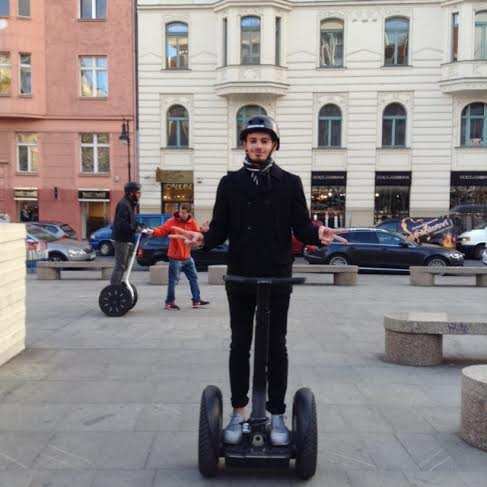 We all had a great time touring the city on Segways. Although a few of us were nervous at first, we quickly got the hang of it and within minutes we were off and away. We drove through a lovely park and saw a wonderful overlook of the whole city which made for a great photo opp. Everyone agrees that Mara is the designated photographer for the trip. She’s already gotten some amazing shots! We then drove past the Prime Minister’s residence as well as the Czech President’s residence and to Prague Castle. 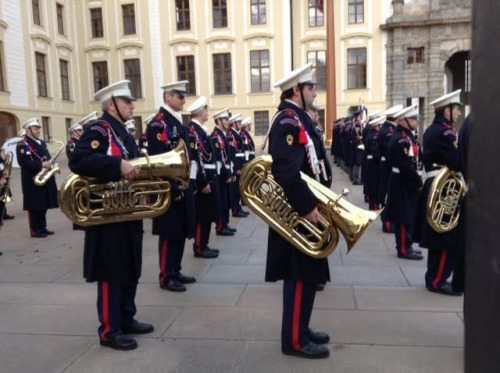 It seems that they knew we were coming because as we arrived at the castle the military band began to play and we watched as the guards marched in formation from the castle towards their base. Continuing on we arrived at Prague’s famous John Lennon Wall. This wall is the only wall in the city where it is legal to paint graffiti. We each added our own messages to the wall as well. Across from the Wall is the French Embassy and since Friday night the courtyard has been filled with thousands of candles. It seemed fitting that the French in Prague are located just opposite a place that has become a symbol of peace and free expression. Our next stop on the tour was the National Theater and then we were on to Wenceslaus Square. 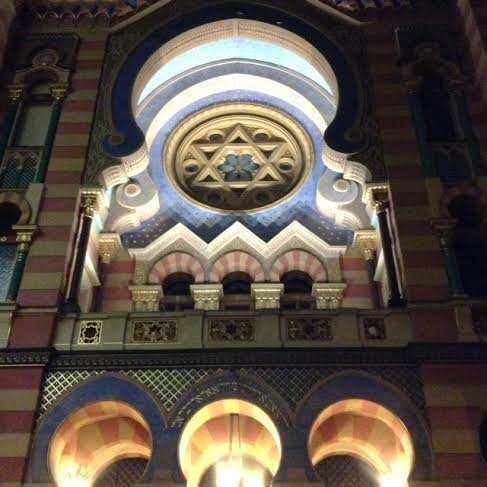 We then visited the beautiful Jerusalem synagogue with its colorful unique facade. Next we visited the Powder Tower, Tyn Church and Old Town Square. There were many other sites and statues pointed out to us along the way. Our two hour tour turned out to be more than a three hour tour and everyone loved it. The guides even commented that Gil and Scott we’re so proficient on the Segways that they could get jobs as a guide. 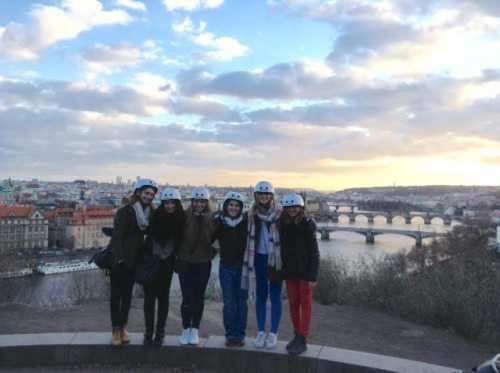 When we finally had our feet planted firmly back on the ground, everybody had some free time in the center of Prague before we met up for dinner. Our evening involved going back in time… We ate at a Medieval Tavern complete with live, traditional Czech music, dancers, and authentic Czech dishes. The bagpipes and other instruments really set the stage and we had a great time watching the sword fighting and other performances throughout the restaurant as we ate. Having been on the move all day, we are pretty exhausted! We are having a wonderful time and the weather, although a little chilly, has been lovely which is great since we have been outside most of the day. Tomorrow we’ll be visiting the Jewish Museum and cemetery, meeting with the Israeli Ambassador, taking a boat ride down the river and enjoying a cool black light theater performance in the evening. 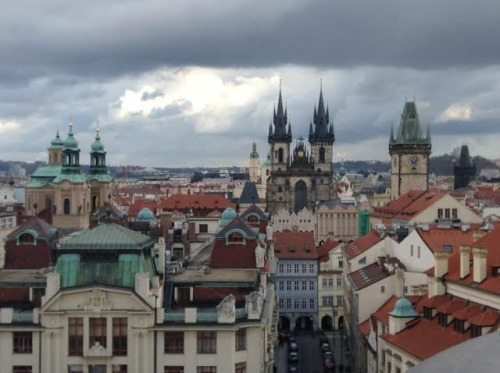 Today was another full day in Prague. 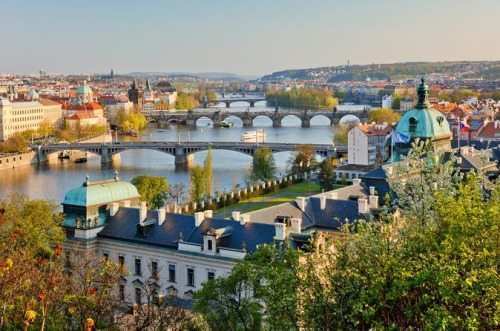 We started our day by walking over the famous Charles Bridge which was built in 1357. Surprisingly it was mainly empty of the artists and vendors that usually have their stalls set up across this pedestrian bridge. Perhaps the chilly and sometimes drizzling weather kept them away. The upside of this was that the bridge was not crowded and we were able to really enjoy our stroll, taking in the view down the river, and checking out the statues and other adornments on the bridge. 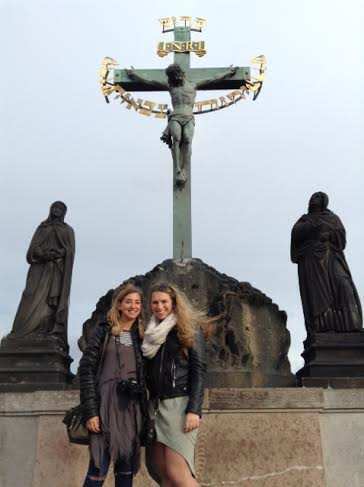 We stopped in front of one particular statue (see attached photo) and talked about the significance of the Hebrew verse affixed to a crucifix. Legend tells us that a Jewish man who refused to take off his hat in front of this statue because it was considered idolatrous, was fined for his refusal to show honor and respect to the church. The funds collected from him were then used to add the Hebrew verse to the statue. 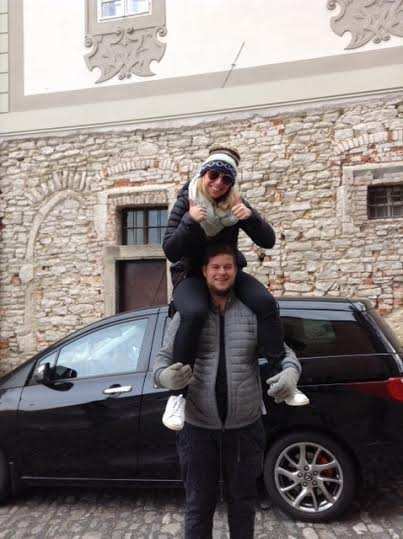 Next we arrived to the Jewish quarter, Josefov, where we explored the Jewish Museum set up throughout the neighborhood – several of the old synagogues, which are no longer in use as active shuls, now house a variety of exhibits which trace the Jewish history of this area. Our first stop was the Maisel Synagogue which was built in the 16th century at the initiative of Rabbi Judah Low, known as the Maharal. 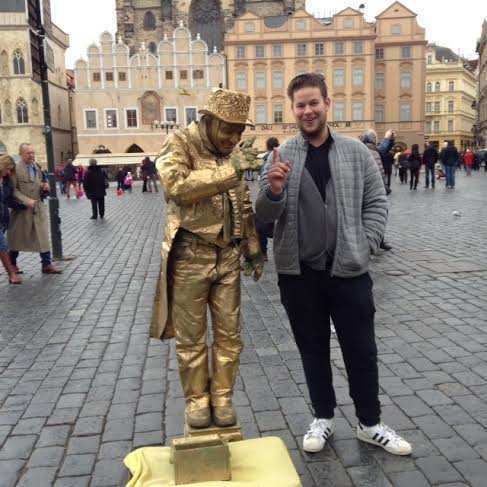 There we discussed the legend of the golem of Prague, for which the Maharal is credited with creating. We also reviewed a brief history of the Jewish community of this area. Inside the synagogue Emma discovered a display about a relative of hers. At the next synagogue we were overwhelmed by seeing thousands of inscribed on the walls: names of those who were killed during the Holocaust along with their dates of birth and death. 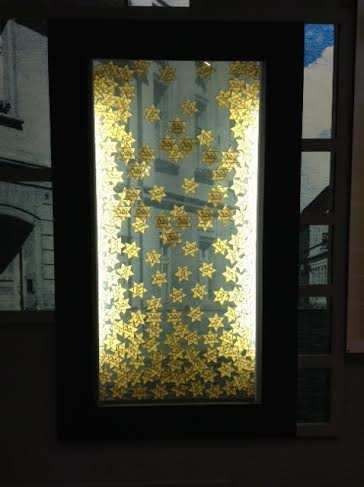 We also found ourselves not knowing what to say as we explored an exhibit of the artwork of children who have been deported to Terezin. 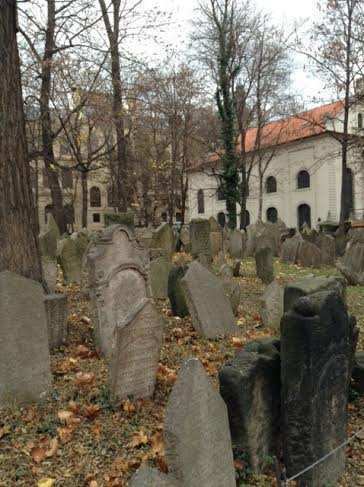 The next site we visited was the Jewish cemetery. The oldest grave in the cemetery is over 500 years old. We talked about what you see on a gravestone and the various Jewish symbols which are often represented. For example, the sign of the Kohain. As we walk through the cemetery I challenge the students to find a symbol or words or letters that they found interesting or connected with. I distributed to each student paper and crayons and they were asked to do were rubbing when they found something of interest. When we as exited the cemetery we shared our rubbings and saw that we had found pictures of a lion, a bunch of grapes, a Jewish star and a flower. We also made a special stop at the grave of the Maharal and many of us placed a stone on his grave as is traditional when you visit a grave. In the Jewish ceremonial hall, next to the cemetery, we saw beautiful tzedekah boxes and other items dating back hundreds of years. Moving on, we walked he short distance to the Old Town Square and we interacted a bit the the street performers and grabbed a small snack. As it neared noon, we all stationed ourselves in front of the famous Astronomical Clock and we waited to see the action at the stroke of noon. It was a little underwhelming to see the clock do its thing (think cookoo clock, but less interesting). In the afternoon we boarded a tram for the first time and we made way over to the Israeli Embassy. Ambassador Gary Koren spent an hour with us, sharing his own background in the diplomatic corps which is spend the last 30 years, some of the challenges and benefits of this career, and of course he spoke about the relationship between the Czech Republic and Israel. 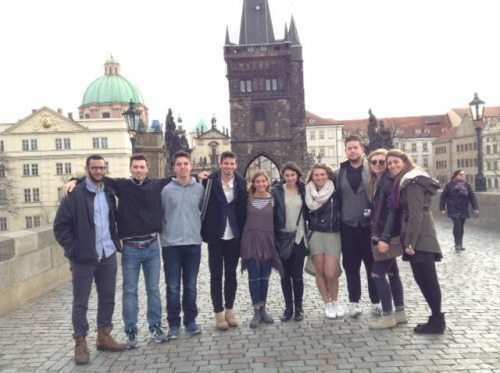 We were surprised to hear what a strong supporter the Czech Republic has been to his Israel. The ambassador also spoke about the rise in Islamic fundamentalism and the risk of terrorism throughout Europe. He shared with us his belief that Europe will begin to adopt some of the security measures which Israel has employed for years to protect it’s citizens. It was a wonderful visit and we learned a lot. 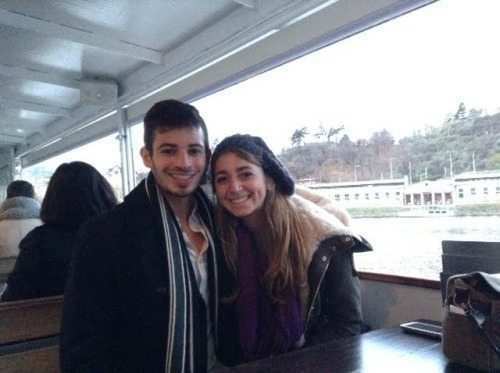 After some free time to shop and drink hot chocolate, we boarded a boat and took a relaxing cruise down the river. In the evening, we ate at an amazing vegetarian restaurant. It was so good that we opted to do dinner family style so that we could all taste everything! Our evening program was a black light performance show at the Image Theater. The show festered modern dance and other elements And what was unique was the stage was lit in black light and the performers were dressed in neon and white to create a cool effect. There also was a portion of the show with actors doing a sketch which involved audience participation… Dylan was brought on stage and was arrested and thrown in jail (in the show). It was a strange show to be honest, but everyone enjoyed seeing this small sliver of modern Czech art culture. We had such a busy day on Friday, there was no time to send out an email yesterday before Shabbat came in. We started the day by heading out of the small town of Terezin. Prior to World War II this town was home to about 5000 residents. In November 1941 the Nazis began bringing transports of Jews and eventually all the local residents were relocated. 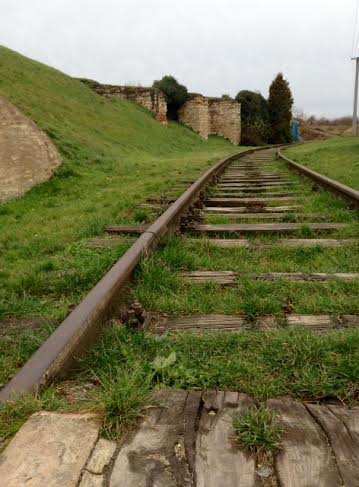 At the height, the ghetto in Terezin held nearly 60,000 Jews. The infrastructure clearly was unable to support this large population and thus there were issues with electricity, water, sewage, food, and medical facilities. Although this was not a death camp, thousands died due to the terrible conditions. 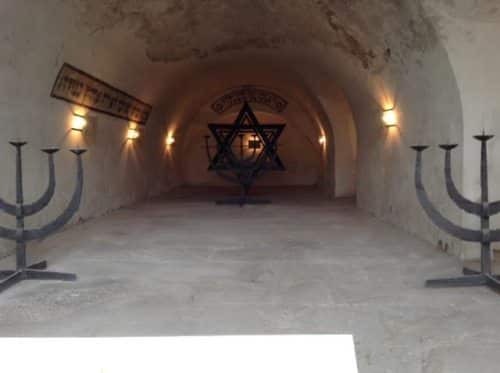 Our visit in Terezin included the Ghetto Museum, the Barracks, the Ceremonial Halls, Morgue, the Columbarium (where the cremated ashes were stored), the Jewish Cemetery, the Crematorium, and a Prayer Room. It was surreal for us to walk around the village seeing stores and local residents – we couldn’t understand wanting to live in a place that had been a place of such tragedy. In the museum, I think many of us were particularly taken by the artwork drawn during the war by Jewish prisoners of the Terezin Camp. 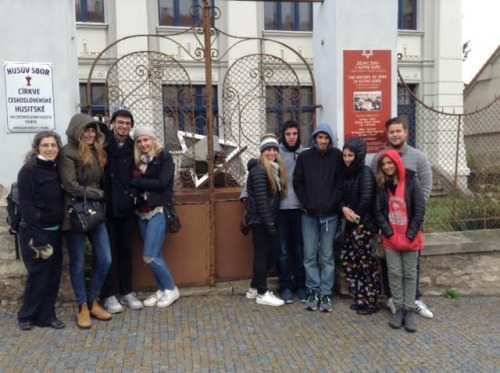 The propaganda film, showing life for the Jews in Terezin, used to fool the world into believing that the conditions were favorable in the ghetto, was also impactful for us to watch. While in the Ceremonial Hall, we read several poems written by children imprisoned in Terezin. Some spoke of sadness and the harsh reality of life in the ghetto, while others spoke of hope and faith in God and the Jewish people. At the cemetery we all recited the mourners Kaddish and we discussed how this prayer does not speak of death but rather it is a prayer for life and peace. With everything happening in Israel, France, and the world in general in the last few weeks, it seemed particularly relevant to stand in a place that represents the worst evil of humanity and reaffirm our belief in peace. 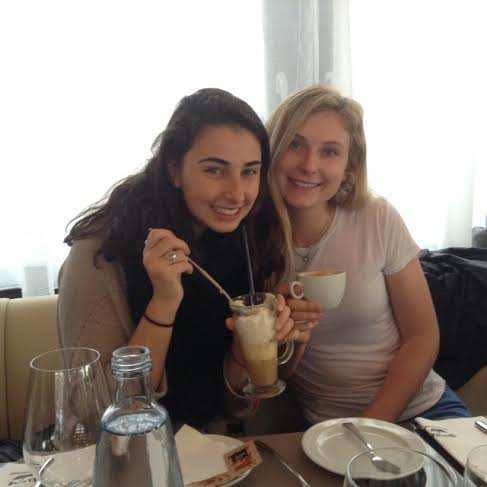 Once back in Prague, we had a chance to visit a shopping mall and take a break from the heaviness of the morning. And then we headed back to the hotel to get ready for Shabbat. Friday was a long day but we all appreciated the chance to learn so much about Czech Jewish history and today’s realities for the community. While at the castle, we also visited St Vitus Cathedral built in the 1300’s and considered the most important church in Prague. It’s also the largest. This church is not only used for religious services but also for the coronations of the Czech Kings and queens took place here. Moving on we visited the Klementina which houses the National Library and we visited a beautiful old baroque library as well as the Astronomical Tower from which we had a 360 degree view of the whole city. 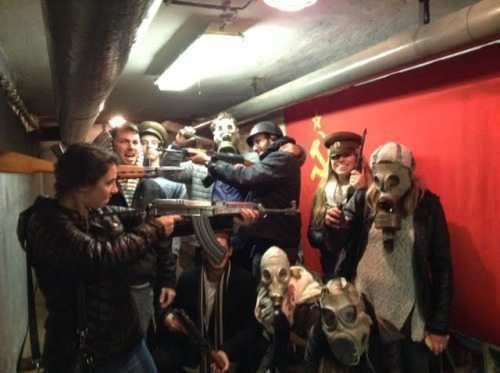 In the afternoon we went on a really cool tour to learn about communism in Czechoslovakia and we visited a nuclear bunker decked out with tons of memorabilia from that era including gas masks, weapons, uniforms, and posters. 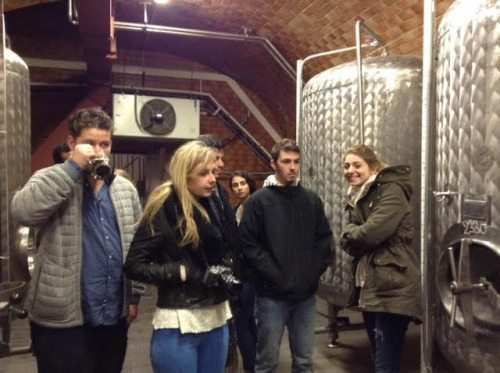 We really enjoyed the tour and we made a new friend – joining us on the tour was a guy named Miles from England. Next we spent a little time at Wenceslas Square. Dylan (known as Billm by the folks at starbucks), really enjoyed his macchiato as a great escape from the cold. Our evening began with a visit to the famous U Fleku Brewery. 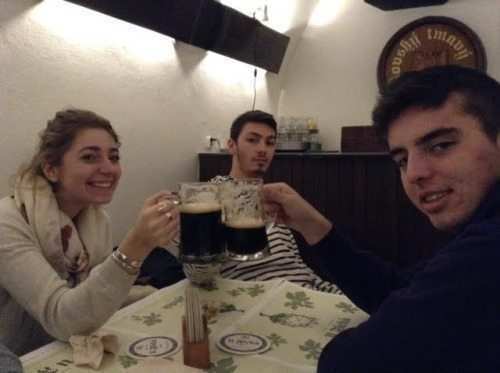 This family owned brewery has been making beer for over 500 years. It was delicious and it was cool to see how the whole brewing process works. Finally, we ended our day with laser tag, an activity very popular with young Czechs these days. It was a good thing I was playing along with the students so Julia didn’t have to come in last during the first game. In the second game, Julia’s team won with Scott, Emma and Kobi. The rest of us put up a good fight but it simply wasn’t enough to take the crown. 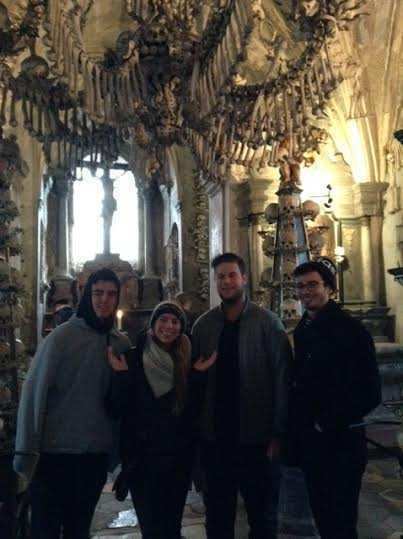 The first place we visited in Kutna Hora was the Sedlec Ossuary, also known as the Bone Church. 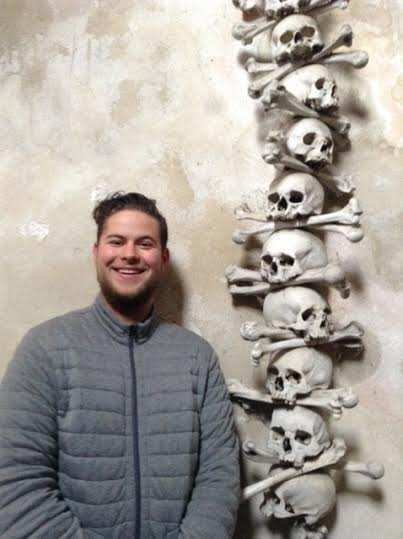 One of twelve World Heritage sites in the Czech Republic, the church is estimated to contain the bones of between 40,000 to 70,000 people which have been artistically arranged to decorate the chapel. In the 13th Century, one of the leaders of the church returned from a visit to the Holy Land with a container of soil he had brought back from Jerusalem. He sprinkled the earth throughout the cemetery and thus this burial site around the church became very popular. As the years went on and the area suffered through the plague and wars, they ran out of room for burying the bodies. 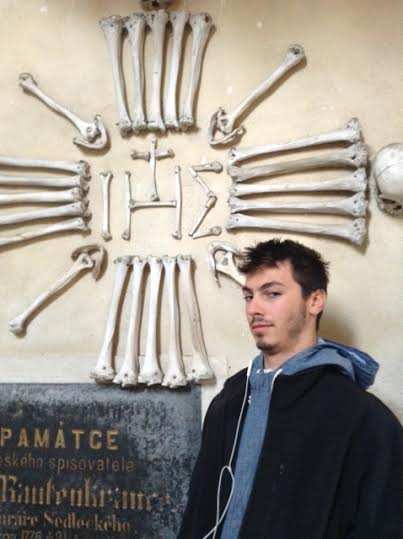 Eventually, the bones were stacked inside the church and later a man and his two sons arranged the bones to the designs still intact today. The next place we visited was the former synagogue of Kutna Hora. 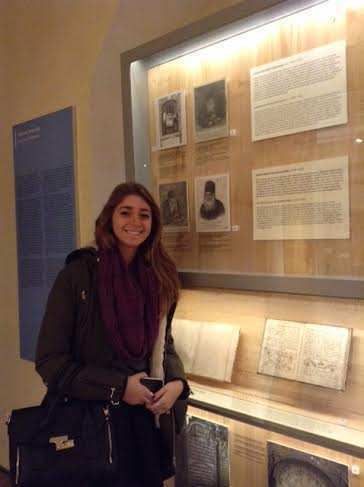 Although the Jewish community was not large here, the history does trace back many centuries. As was the case in other places and times in our history, the Jews were once inhabitants, later were expelled, then returned and it happened again. 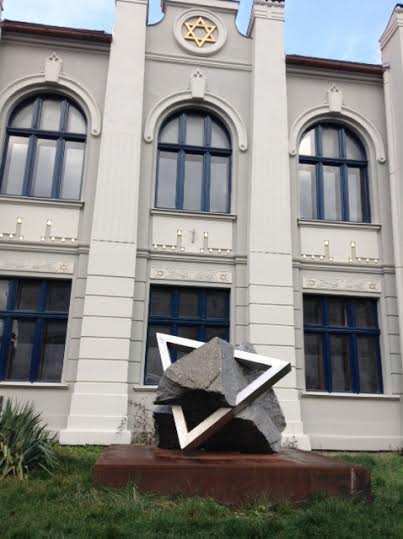 The synagogue building was built in 1902 and served the community until World War II when the Jews were transported to Terezin. Most were then sent onwards to death camps and very few survived the Holocaust. The building today appears to not be in use but since WWII it was used as a church and then later by an organ manufacturer. In 2012 a memorial was put in place by the descendant of one survivor to remember the community which once existed. In the afternoon, we visited St Barbara Cathedral which is also a UNESCO World Heritage site. The construction of this beautiful building began is 1388 and was finally mostly complete in 1588. One of the most stunning features inside was the original gold leaf organ. We also visited the Italian Court, a complex which housed the palace and the mint. 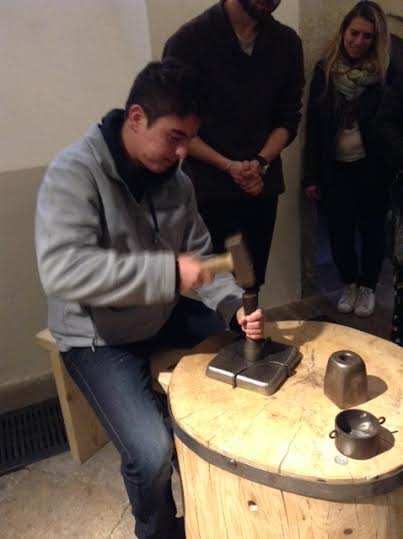 We had a wonderful tour which included explanations of how the silver was coined as well as a chance for us to try our our hand at stamping coins. We also visited part of the palace and given the low door frames we concluded that the king much have been half Dylan’s height. Returning to Prague everyone was exhausted from an incredible five days of constant touring and we settled in for a relaxing dinner, a quick stop at the souvenir shops next the the hotel, and off to the airport we went. The flight was uneventful and before saying our goodbyes in Ben Gurion Airport it was time for the next episode of “Aardvark Top Tourist.” I explained to those who hadn’t been on the previous trips that they in fact had been part of a reality show all along and now was the moment of truth. The competition was steep with Dylan and Gil coming in a close second and third. And……….. The winner was….. Drum roll please….. Kevin!!!!! I had a wonderful time traveling with the students and the trip was a great success. Now that everyone presumably has had some sleep, I’m sure you’ll have a lot about it from your children!